The EU funded European research project FILOSE has developed robots with a new sense – lateral line sensing. All fish have this sensing organ but so far it had no technological counterpart on man-made underwater vehicles. In an article published in Proceedings of the Royal Society A, FILOSE team members describe a robotic fish that is controlled with the help of lateral line sensors. During the last 4 years, the FILOSE collaboration has investigated fish lateral line sensing and locomotion with the aims of understanding how fish detect and exploit flow features, and of developing efficient underwater robots based on biological principles. 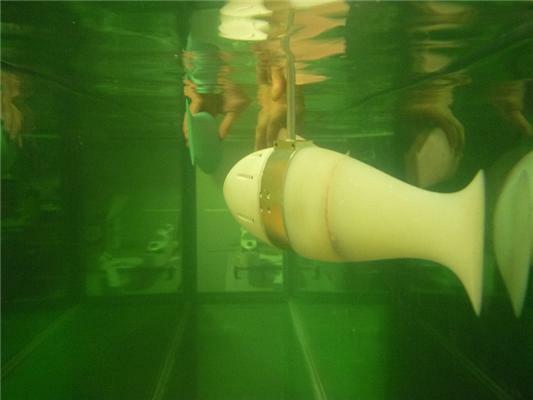 Experiments with flow sensing and actuation in FILOSE have demonstrated that a fish robot can save energy by finding energetically favorable regions in the flow where the currents are weaker or by interacting with eddies so that they help to push the robot forward. The robots are also able to detect flow direction and swim upstream or hold station in the flow while compensating for the downstream drift by measuring the flow speed. The lateral line sensing fish robots have been a joint effort of experts in fish biology (University of Bath, UK), underwater robotics (Tallinn University of Technology, Estonia), mechanical engineering (Riga Technical University, Latvia), signal analysis and flow perception (Verona University, Italy) and of sensor technology (Italian Institute of Technology). This entry was posted in news and tagged filose, robotic fish, tallinn university of technology. Bookmark the permalink.